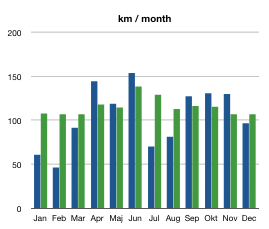 Blue = 2007, green = 2008: Consistently over 100 km/month! 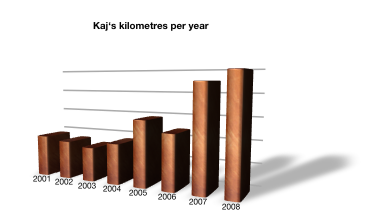 For 2008, I look out to run more and faster than 2007, and to be able to support more mountaineering, more snowboarding, and perhaps a “trans Alp” on a mountain bike. Whether I’ll go for my fifth marathon somewhere remains to be seen. I still haven't biked the trans Alp, but I made the other items beyond expectations! If things go on this way, I will soon consider myself a former coach potato. But perhaps I had better not pursue such a thought, since then I might risk stop running. Ёлки Палки means "firs poles", if you believe Google Translate. In this case, I don't. 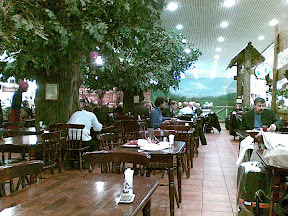 But Elki Palki is an excellent place for kajsher food. "Kajsher" refers to my self-imposed dietary guidelines, which involve low fat, no excess sweetness, and avoidance of red meat, all while maintaining good taste. Basically, what I consider to be healthy food. Fish and vegetables made without unnecessary fat (steamed, grilled) are excellent examples of kajsher food, sushi is another. After this self-indulgent description of food I enjoy, let me say that Russia is a place which nowadays very much complies with my wishes. 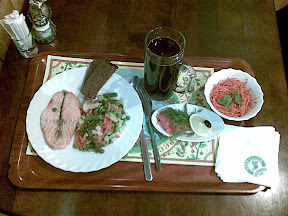 This is what I had at Elki Palki today, at Domodedovo Airport, before heading home to Munich: Salmon, more salmon still, boiled vegetables, raw carrots, dark bread, some kvass to drink. 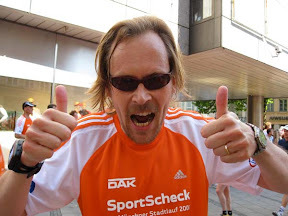 This blog post is dedicated to fellow Moscow visitor Zack Urlocker, with whom I strolled along the Arbat in Moscow, just when Zack had taken over MySQL Engineering in 2006. 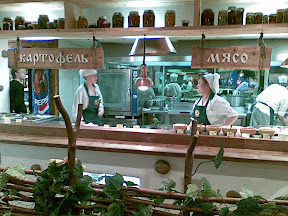 We quickly identified an outlet of the Russian fast-food chain Moo-moo. The black and white pattern is supposed to look like a cow. The Russian spelling "My-My" has nothing to do with MySQL. 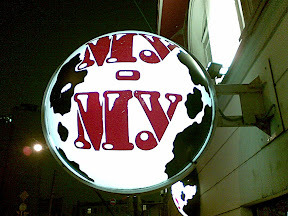 Today, I passed another Moo-moo outlet, but resisted the temptation to enter. I have shared some other experiences from this trip in Russian and in Swedish. In Swedish, I've described the very comfortable train ride from Helsinki to Moscow and the challenging local transport with the subway from the railway station to the hotel. 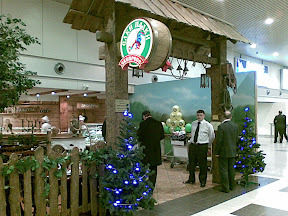 In my own (and Google Translate's) version of Russian, I just managed to write about the train journey.